Mayon Volcano, known for its perfect cone shape, is one of the most popular tourist destinations in the Bicol Region in the Philippines. It is often seen in textbooks and postcards, but seeing its picturesque structure in person is all the more satisfying. As the top attraction in Legazpi, Albay, it could be marveled upon from different locations in the area - even from the window of your hotel room! #1 - The Oriental Hotel: Built on the top of a hill, this hotel is raised higher than the whole area giving an almost unobstructed view of Mayon Volcano's structure. 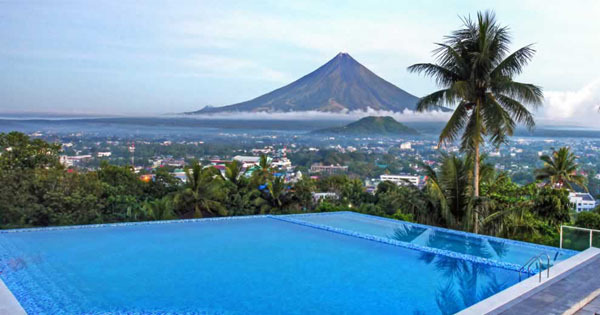 While most of their rooms have a great view of Mayon from its windows or an own veranda, the best view is from the hotel's large roof deck where the infinity pool is. You can either dip in the pool or just relax on one of the woven couches while overlooking the wonderful view of the Mayon Volcano. #2 - Embarcadero Hotel: Located at the heart of Embarcadero de Legazpi, this hotel makes a maritime illusion primarily because of its panoramic view of the Albay Gulf. Additionally, most of the 132 nautical-themed rooms feature a view of Mayon which is on the left side of the hotel. Thrill-seekers could level up their viewing as the lighthouse just beside the hotel has a 350-meter zipline with the Mayon Volcano on the background. #3 - Balay de la Rama Bed & Breakfast: If "balay" is the Bicolano word for "house," this B&B is the perfect home away from home, but with the backyard view of Mayon Volcano. Two of its six air-conditioned rooms have a private balcony with the direct view of Mayon while the others are located under the shade of the mango tree in the garden. Authentic Filipino breakfast is included in their accommodation and the other meals can also be served upon request. #4 - Casablanca Suites: Situated in the middle of the lively city of Legazpi, this hotel is just less than 5 minutes away from the airport, shopping malls, hospitals, government units, etc. but is still away from the busy streets. Just upon entering the lobby, the tip of the Mayon could be seen. Each of its spacious 19 rooms and suites has either a view of the countryside or the Mayon Volcano. They also offer native cuisine at their in-house restaurant. #5 - Third & Sean's Place: Live like a local in this family-run boutique hotel that features great hospitality and facilities that make you feel at home. Get more value with your money without sacrificing comfort as they provide superb service and accommodation at an affordable price. Perfect view of the Mayon Volcano is also accessible from their rooftop deck or for some rooms, an own balcony. #6 - Hotel Venezia: Located in a quiet subdivision, this 40-room townhouse-looking boutique hotel combines the warmth of a home and the convenience of a hotel. They offer different choices of accommodation, some having verandas facing the Mayon Volcano. They also have a pool, a fitness center, and a restaurant that serves Italian food and is open daily for breakfast, lunch, and dinner. #7 - Misibis Bay Resort: Indulge in the luxurious relaxation and adventure that this resort in Cagraray Island in Albay could offer. This 5-hectare beach resort and hotel have 53 rooms and 37 villas that has either a view of the beach, pool, or garden. There are many activities that could be done such as ATV ride, jet ski, kayak, etc. but probably the most relaxing activity is witnessing the sunset on The Five Views, a petite patch of paradise with views of Mayon Volcano.